We did a trip to Sa Pa last year (in November) but I wasn’t able to update information at that time. 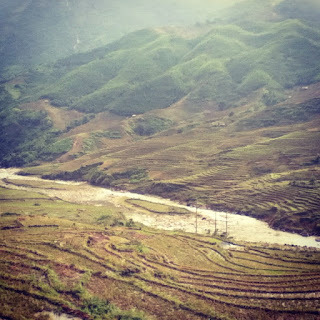 It’s late but all of emotion and memories about both the trip and Sa Pa’s beauty are still in my mind. We, including 5 Vietnameses, 2 Germans and 1 Canadian, had booked train tickets with around 250.000VND/ soft seat. We gathered altogether at Hanoi train station at 7pm, took the train and started our trip at 7.30. The train was not bad except for stopping randomly. This made me not be able to sleep. During 8 hours on train, I slept for only 2 hours and stayed up for all the rest time. We arrived at Lao Cai train station at 4 am. It was still covered in dark, cold and rain. With the shorts I was wearing at that time, my legs seemed frozen due to the cold and rain (Sa Pa lies at an altitude of about 1650 m, so the climate is moderate and rainy in summer (May—August), and foggy and cold with occasional snowfalls in winter). Therefore, I had to quickly get in bus after getting out the station. After 40 minutes, the bus dropped us in front of the Post Office Guesthouse, the place we had booked before for our stay. It has that name as it is next to the post office. (and it’s very convenient to stay next to the post office because of free wifi using anytime :D). The guesthouse wasn't modern, it was like an ancient house. Not very beautiful but OK and reasonable to for 2 day stay. We slept for 2 other hours, then got up, went out for breakfast with “Phở” – Vietnamese traditional noodle, and took a bus to go to Heaven Gate. The path to go there was good but zigzag because it was built on the mountain. It was raining at that time so the weather was a bit cold. Heaven Gate hid itself in clouds that created a stunning view. From the Heaven Gate, people can see the entire view of a large valley, the path to go to Lai Chau, Silver Waterfall…. Despite the cold, rain and everything, we got off the bus as soon as reaching this spot and took photos every moment. The most interesting thing was that clouds were everywhere and we were cover by clouds. Our next stop was Golden Stream and Love Waterfall, which are destinations in Sa Pa. Until now, I still don’t know why people named that stream “Golden Stream”, but I think the reason lies on underwater stone’s color (they are golden). To go to Love Waterfall, you have to walk for a while along a small path. The left side of the path is plants, the right side is stream. The waterfall is named after a love story between a fairy and a woodsman. People said the waterfall looked like a leave hat – a traditional hat of Vietnam (I don't think so though). After that, we went to Ta Van Village, had lunch with seven color sticky rice, grilled pork and boiled vegetable ( I forget its name). Then, we walked to the inside of the village, met some foreigners here. We were amazed by vendors’ English skill. I know they might not be able to read and write English, but their speaking skill is very good. However, the worst thing was we were covered by these vendors. They begged us to buy their stuff, which made us scared. It seemed we were attacked. It was very sad. I think Vietnamese tourism need a change, such as gathering these vendors and train them, making them more professional and organizational. We had a dinner with hotpot around 8pm. The hotpot cost 100.000 VND/person. It was reasonable as the hotpot was very good with salmon, tofu, seafood, beef, vegetable, chicken and so on. Lovely hotpot! Then, we took a look at night market, where local people sell their handmade stuff like necklaces, skirts, bags, etc… Next, we chose a nice and warm Danish café to enjoy some coffee and ice cream and chat chit. The day after, we visited Ham Rong Mountain and the fee was 70.000VND/person. There were many areas there, such as Orchid Garden, Zodiac Area, Heaven Gate (another haven gate),… The views were awesome. Some areas looked like Europe, some were like Vietnam. From the top of this mountain, people can see the entire city covered in clouds. So beautiful! Lunch time came and we had noodles, soup and rice in a restaurant. Then, we walked around, went try some shops and visited the stone church in the center of city. Nice one! We said goodbye to Sa Pa at 4pm, then went to the train station to be back to Hanoi. The train was similar to the coming one. Stopping randomly, but the worse was ours seats were hard, not soft ones or beds, so it was very hard to sleep on that although I was very sleepy. But it was also an unforgettable experience of this trip. This is the second time I have been to Sa Pa. After 12 years, I can realize how quickly Sa Pa has changed. It’s more modern and denser than it was before but its natural and simple beauty is still remained. Nice time in Sa Pa was done. Only 2 days but it's worth it. See you in some day, Sa Pa!